There are no decorations up at my house. There is a box of unopened gifts, sent by Carole and Larry, under the table in the living room. Other than those and the cards with their envelopes stacked on top of the table, you'd never know it was Christmas when you walked in the door. It's very hard to be motivated to decorate in any fashion when you're traveling and you're tired. I have a couple of new ornaments I'd love to display this year, and I had every intention of doing just that, but fate, and work, had other plans. At night, I can see the decorations of neighbors and, frankly, am content to have that be Christmas this year. One of the best things about my job is getting to go behind the scenes, or during off hours, of places the public only sees on the days these places are open. Museums and monuments have always fascinated me. I enjoy history and being allowed to do my "thing" solo or accompanied by maybe a maintenance person, is a joy. Recently, I needed to inspect this museum. This house, built in 1882, was the first private home, in the world, to be lit by these new-fangled electric light things. The home is huge. It was fascinating to me to wander about, as I'm looking for defects, and try to imagine what life was like to live in a house this big. 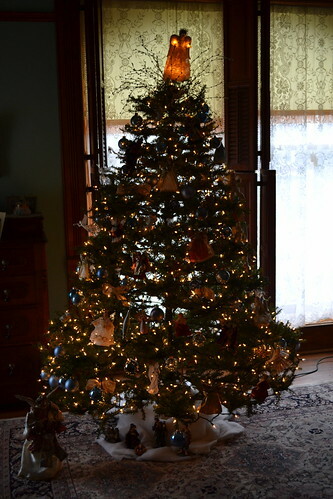 It's decorated for Christmas, too, so while I am not decorating, I could celebrate vicariously through the trees in the home. This one was on the first floor in a study. Since I wasn't part of any organized tour and the staff had other work to do, I don't know how much of the decorations on these trees are historical. I didn't get photos of the huge trees on the first floor other than the one in the study because it didn't occur to me, until I was on the second floor, that I could document these and blog about them. This is one on the second floor in a bedroom. Of course there would not have been the lights. 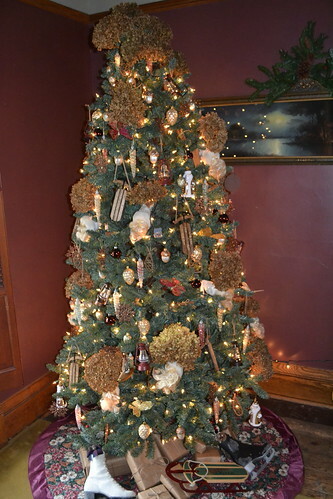 I only know about "historical" decorations from movies such as Meet Me In St. Louis, where the "lights" were actual candles wired to the tree branches. Another tree in another bedroom. What were the decorations in a home of this opulence? I suspect the ribbons could have been used. Were there trees in every room, too? This was in the father's room. It seems it would have been way overkill and that this is a convention for the holiday as befitting a museum. 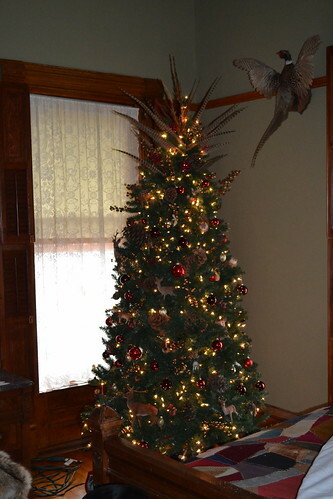 The above tree has phesant feathers at the top. This tree has more nature-based ornamentation than others. The large brown blobs are dried hydrangea blossoms. What's also neat about this photo is the background wall color. This burgundy red, I was told, was one of the original colors of the home. I was quite surprised to hear this. 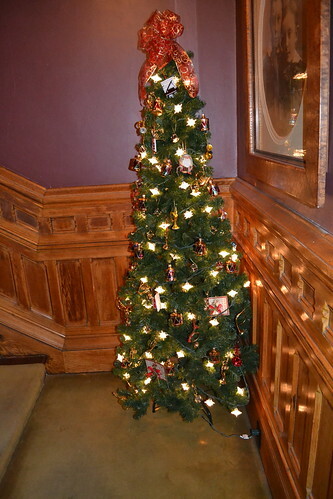 This is a tree in the stairwell. This burgundy worked very well with all the wood on the first floor and in the stairwells. (It's a three-story building.) I was told that during renovations, sections of old paint were flaked off and this color was found as a bottom color. Doesn't that look like a very modern color rather than something with roots in the 1880's? This is a color of the rich. Red was hard to make. In everything from textiles to glass wear, red items meant you had money. I knew that 'royal' blue and 'royal' purple gained their monikers because the dyes used to achieve those deep colors were so expensive, only royalty could afford them. It never occurred to me that this burgundy would be a color of status. Did they pack in the ornaments as these are decorated? Some of the glass globes, I recognized from the globes I have which were my great-grandparents. 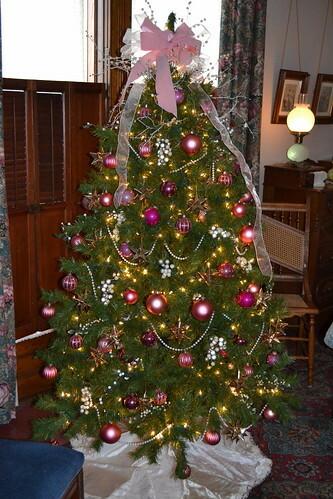 Because the building did not become a museum until the 1980's, many of the decorations appear to be from the time period the building was opened to the public. 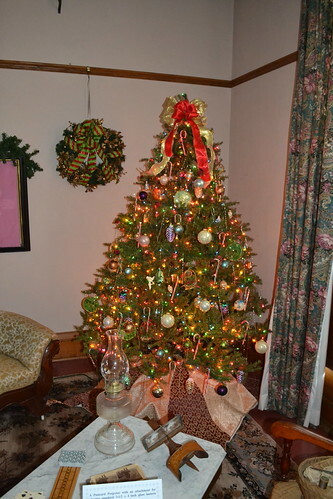 There are a lot of reproduction ornaments available to achieve a historic-looking decorated tree. So this is my exposure to Christmas this year. It's kind of funny, but there was a great sense of peace about the house. There were no other people in the building besides me and 3 staff members. 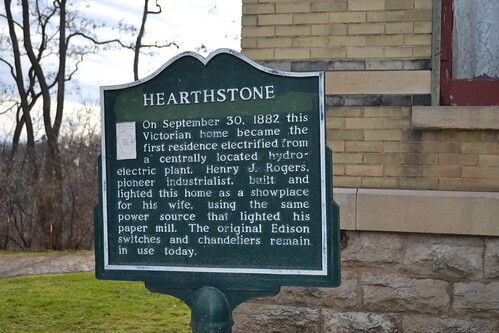 The museum had a hectic schedule ahead of school tours and is a great resource to the Appleton, Wisconsin community about life at the turn of the last century as well as a connection to Thomas Edison and the development of the electric light. Without a lot of people in the building, I could stand and just be. I did have a laugh at one point. When I walked into the father's bedroom to look at the floors, walls and ceilings, I had this distinct feeling I was being watched. I turned to my left and saw this. 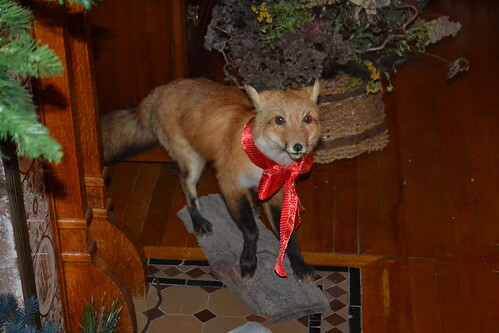 Even the fox is decorated.